finally! 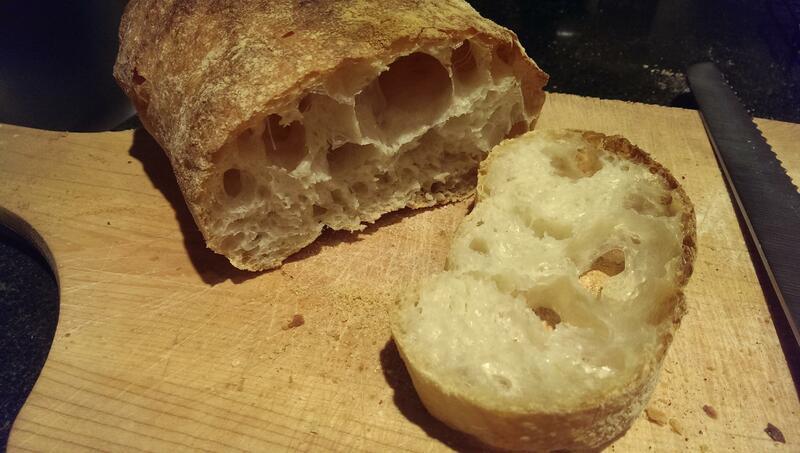 ciabatta results I like. after messing about on and off for a couple years, I combined the poolish ciabatta with the Jason cocodrillo. Nice fermented delicate flavor. mmmmm. took about 30 mins on 4 with my Concept 7 mixer. I used a smaller recipe then Jason listed because I had the poolish too. I've gotten much better at handling wet dough. Nice oven spring on unglazed terra cotta tiles. That's a long mixing time. Would you attribute the large holes to the long mixing times, or something else? I dunno what to attribute the big eyes to, but based on past experience I'd guess the mixing time. "beat the 7 bells out of the glop". sort of. I messed with JMonkeys recipe here. And a little bit of the Ponsford folding methodology. tastes good, owing to the poolish. Crust is a wee thin. Crumb is not quite. I think my timing was off a bit. You want a thin crust on Ciabatta. Is the crumb slightly chewy? That would be Perfect!